ARX Trustees Limited is geared to assist clients in Company Incorporation, Advisory, Corporate & Trust Services, Setting up of Foundations and General Support Services. We also assist Corporate Clients in re-locating their business to and from Malta. Through our international network we can assist clients in re-domiciling to and from other reputable jurisdictions. Furthermore we offer support services in multi-jurisdictions, such as handling the process of Registration and Incorporation of Companies, Trusts and other Special Purpose Vehicles. We pride ourselves of being innovative, professional, and independent. We continuously seek to achieve higher quality service and effective delivery services and set higher standards of ethics and practice. ARX is a corporate services provider which is licenced by the Malta Financial Services Authority to provide fiduciary, trustee and administrative support services to corporate and private clients. assistance to private and, high-net worth clients, family offices, wealth managers, trusts and foundations, in their or their client’s tax structuring, asset ownership / management and inheritance planning requirements. We service a number of International clients by offering strategic assistance in aircraft, ship and yacht registration, mortgage registration, financing, brokerage, maintenance, classification and surveying. ARX has specialised personnel to assist with all the requirements relevant to any service in connection to Intellectual property. We assist and advise local and multinational clients operating in Malta and other jurisdictions to Incorporate Company Structures in Malta and assist them with the redomilcilaition of the International Business to a Malta Based Business Hub. We collaborate with International firms and consultants to address cross-jurisdictional issues and to better assist clients that conduct business in multiple jurisdictions. Our clients include family owned businesses and multinationals hailing from various industries including energy, funds & capital markets, manufacturing & distribution, maritime, tourism, real estate, sports and pharmaceutical. We are licensed by the Malta Financial Services Authority to provide fiduciary, trustee and administrative support services to both Corporate and Private Clients. We provide professional support services to a number of Private Clients who would consider to do Business in Malta or who would wish to consider re-locating their existing Business establishment to Malta providing Advisory and Support to their related family members and their extended families, employees and dependents with specialised tax, real estate, residence, employment regulation, school admission, as well as family office support as they may require. Moreover we are accredited agents of Identity Malta. We assist qualified Individuals and their dependents in the application and compliance requirements for The Malta Individual Investor Programme (MIIP) that offers citizenship by certificate of naturalisation to individuals and their families. Our professional team including lawyers have the experience and know how to give an efficient, professional and prompt service in these very specialised areas. Backed by our high level of service and our dedication and contacts within the super yacht industry, we are able to offer an above par service for any yachting requirements. This type of prime service is also offered to our Aviation clients. Our team is committed to providing clients with solutions and cover a full comprehensive range of Maltese aviation services. We assist International Clients and Corporate Business Establishments in IP Registration and Management Services related to the Intangible Asset. Furthermore we evaluate tax optimisation using Malta Holding and Trading Structures. Our prime services in the sector reaches out to various industry markets such as Commercial Patent Registration, Image Rights Management for the Sporting Professionals and Performing Artists. We accept Property under Trust and also provide Fiduciary Services, as authorised under the terms of Article 43 of the Trust & Trustees Act Cap. 331 and are licenced to act as trustee or co-trustee as authorised by the Malta Financial Services Authority. 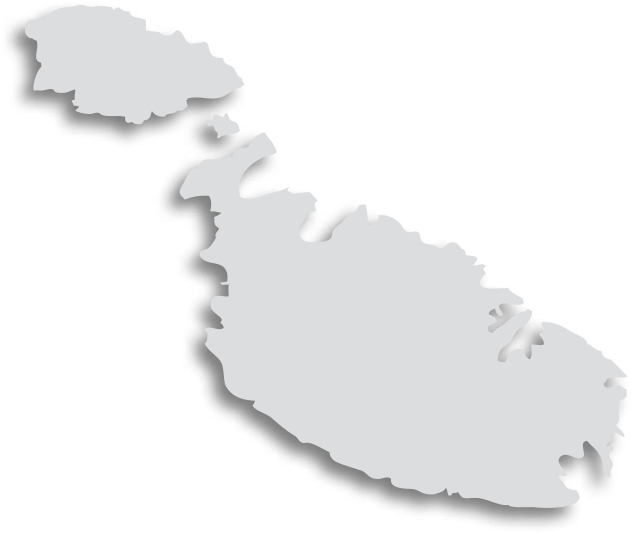 Today, Malta is a democratic parliamentary republic in which executive powers rest with the Prime Minister. The President fulfils the function of Head of State. Elections are contested, for the most part, by the two main parties: the Labour Party led by current Prime Minister Joseph Muscat, and the Nationalist Party headed by Simon Busuttil. Located at the southern tip of Italy and just over 316 square kilometres in area, the Maltese Islands lie virtually midway between Europe and North Africa. Situated at the heart of the Mediterranean, the small island nation has become a major shipping hub with its position on the major East-West shipping lanes granting easy access to both Eastern and Western Mediterranean ports.